Diabetes mellitus (DM) is a primary public health concern, mainly due to increasing prevalence and long-lasting complications. Despite treatment improvements in the last decades, DM remains one of the most incurable life-long diseases that are becoming more common among different age groups of men and women. DM affects various physiological functions, organs, and multiple systems, resulting in an extensive range of highly damaging complications. Type 2 DM (T2DM) is found in those with resistance to the action of insulin, usually as a result of obesity, and/or deficient insulin secretion. T2DM was traditionally a disease of the elderly, but due to widespread poor lifestyle habits and modern life, it is now more common in younger people than ever before. This leads to increased prevalence of most diabetic complications, including microvascular complications, diabetic retinopathy, hypertension and nephropathy, and a higher risk of all-cause mortality. This makes DM one of the leading causes of death in developed and developing countries. In the Middle East and North Africa (MENA), the prevalence of DM is rapidly growing, which could be attributable to factors such as low activity levels, poor diet, excess body weight, lack of health awareness, and health beliefs. Libya is one of the MENA countries, where according to the WHO records, 88,000 people were estimated diabetics out of a total population of 5.6 million people in the year 2000. By 2016, the percentage of diabetic patients in Libya was 13.7% (insert WHO reference from http://www.who.int/diabetes/country-profiles/lby_en.pdf?ua=1). In the last decade, the percentage of diabetic patients has increased worldwide. In Libya, the traditional Libyan lifestyle is characterized by high-calorie foods and sedentary lifestyle, a combination that generally leads to increased prevalence of obesity among the population. Obesity is normally characterized by high body mass index (BMI), which is in turn associated with high lipid storages in adipose tissues that could lead to several cardiovascular complications, including high blood pressure and microvascular and macrovascular complications. An inverse relationship exists between BMI and the age of onset of T2DM. The objective of the present study was to determine the incidence of early-onset T2DM in the city of Zliten, Libya, and investigate if this was correlated with higher risk factors of disease. We performed a retrospective cross-sectional association analysis between the age of diagnosis and parameters of BMI, cholesterol and triglycerides levels, as well as diastolic blood pressure (DBP) and systolic blood pressure (SBP) using data from diabetic patients recorded at their first visit to a diabetic center at Zliten city, Libya, during the year of 2010. This study was conducted in the Zliten Diabetic Center during the calendar year of 2010. The patients who fulfilled the following criteria were included in the analysis are, the first visit Libyan nationality patients; registered in the diabetic center and having a file; resident in or around Zliten area and registered with diabetes for at least 1 year. A total of 911 diabetic patients fulfilled the inclusion criteria and attended during the study. Eight patients had no recorded age and/or age of diagnosis, leaving 903 (433 males and 470 females) available for analysis. Levels of blood cholesterol, triglycerides, and glycosylated hemoglobin (HbA1c) were tested in almost all selected patients. HbA1c was considered high when it was >8% of the total hemoglobin, whereas normal weight was defined as BMI <25 kg/m2, preobesity as 25≤BMI<30 kg/m, Grades I and II obesity as 30≤BMI<40 kg/m, and Grade III obesity as ≥40 kg/m. Data for continuous variables are expressed as mean ± standard deviation and analyzed using parametric tests after log transformation of any variables that were not normally distributed. Differences in means between continuous variables were assessed by Student's t-test. The classification of continuous variables into binary outcomes was as follows: obesity = BMI ≥30 kg/m2, high cholesterol >200 mg/dL, high triglycerides >150 mg/dL, high blood pressure = SBP ≥130 mmHg, or DBP ≥80 mmHg (as per 2017 recommendations by the American Heart Association https://www.acc.org/latest-in-cardiology/articles/2017/11/08/11/47/mon-5pm-bp-guideline-aha-2017). Relationships between dichotomous variables were estimated using odds ratios (OR) and 95% confidence intervals (95% CI) with P values for associations calculated by the Chi-squared test. Correlations were assessed by Pearson product-moment coefficients (r). All calculations were performed with Statistica v10.0 (StatSoft, Tulsa, OK, USA) or STATA v11 (StataCorp LLC, College Station, Texas, USA) using two-tailed tests, and P < 0.05 was considered statistically significant. Demographics for the cohort of T2DM patients from Zliten, Libya, are presented in [Table 1]. In all, there were 903 patients, 433 males and 470 females, with an average age of 52.93 ± 12.44 years (median: 52.00, range: 16–96 years) who had been living with T2DM for a mean of 6.81 ± 6.58 years at the time of sampling. 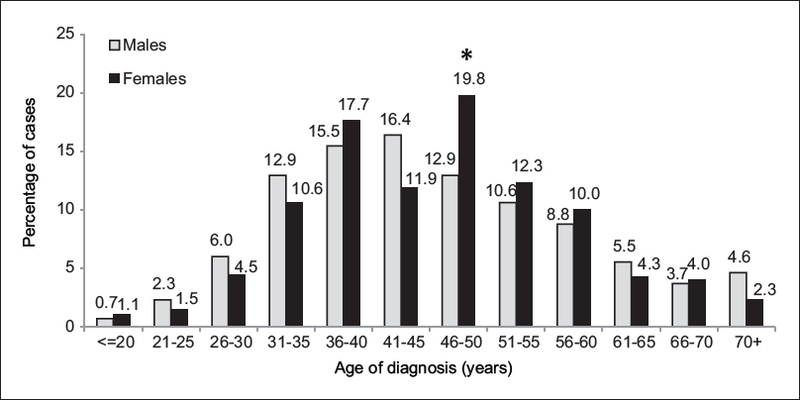 The cohort was divided into two groups according to their age of the first diagnosis (≤45 years vs. >45 years old). This revealed that 455/903 (50.39%) patients were diagnosed ≤45 years of age, with an average age of diagnosis of 36.41 ± 6.37 years which was significantly younger than the average 55.97 ± 8.33 years of age for the remaining 448/903 (49.61%) of patients who were diagnosed at >45 years old (P < 0.0001). In the younger diagnosed patients, 233 (51.21%) were male and 222 (48.79%) were female, in contrast to the >45 years of age where only 200 (44.64%) were male and 248 (55.36%) were female. Hence, men were more likely to be diagnosed at an early age compared to females (OR 1.30; 95% CI: 0.99–1.71; P = 0.0483). This trend was apparent in every half-decade of life ≤45 years (with the exception of 36–40 years old) and again at >70 years [Figure 1]. In contrast, women were nearly twice as likely as men to be diagnosed in the ages 46–50 (OR: 1.66; 95% CI: 1.14–2.43; P = 0.0056), and this trend of female overrepresentation continued until the age of 60. Patients who had been diagnosed at an early age had been living with the disease for longer than those diagnosed later in life (8.06 ± 7.44 years compared to 5.55 ± 5.30 years in the older group; P < 0.0001) and had significantly lower blood pressure parameters. Otherwise, there were no significant differences in blood parameters, BMI, or smoking habits between the two groups. People aged >18 and ≤35 years old are often considered to be at their most productive and said to be “in the prime of their life.” From our data, we noticed about 1/5 of male patients (n = 95, 21.93.%) in this sample were diagnosed as diabetic patients of age ≤35 years old, while the percentage of female patients who a were diagnosed at the same age was only 17.65 (n = 83) [Figure 1]. However, this did not reach statistical significance (P = 0.10). We sought to further investigate variables in men and women that might be more prevalent following early age of T2DM diagnosis in this cohort [Figure 2]. 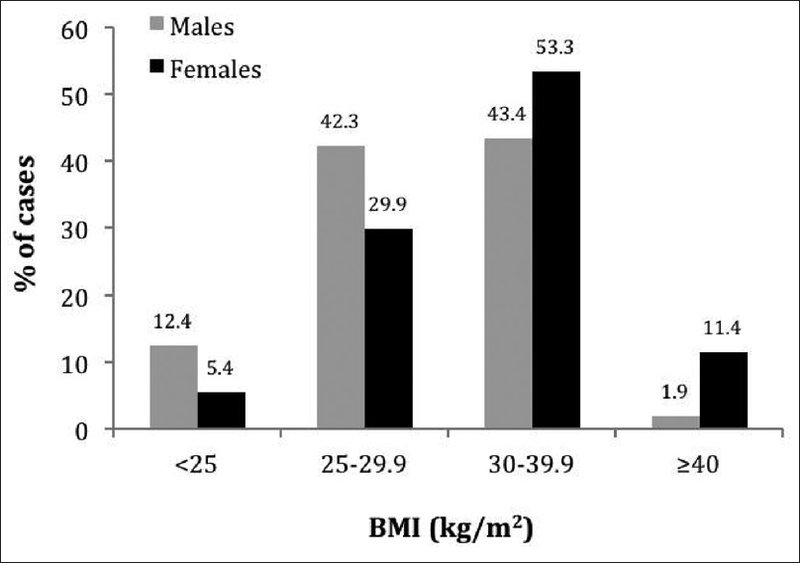 Surprisingly, compared to females, males diagnosed at a young age had lower BMI (OR = 0.35; 95% CI: 0.23–0.52; P < 0.0001). 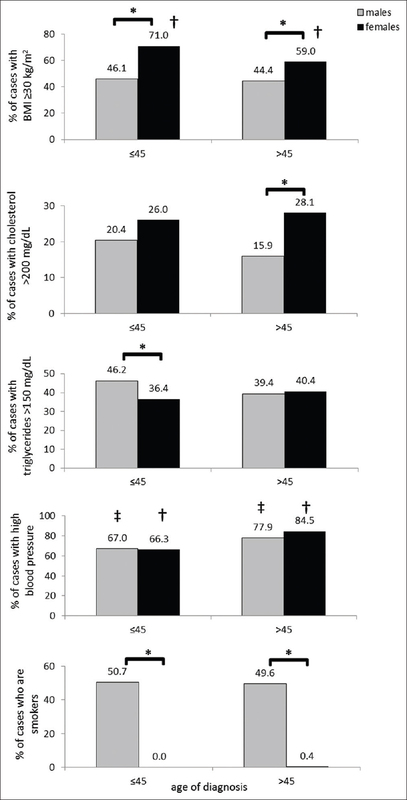 However, they were also more likely to have high triglycerides (OR = 1.5; 95% CI: 0.99–2.28; P = 0.0456). Compared to men diagnosed over the age of 45 years, men diagnosed earlier were less likely to have high blood pressure (OR = 0.58; 95% CI: 0.35–0.96; P = 0.0234) but showed no other significant differences. Compared to males, females diagnosed at a later age had much higher BMI (OR = 0.1.80; 95% CI: 1.21–2.69; P = 0.0023), were more likely to have high cholesterol (OR = 2.06; 95% CI: 1.23–3.52; P = 0.0039), but were less likely to be smokers (OR = 0.00; 95% CI: 0.00–0.03; P < 0.0001). Compared to females diagnosed at ≤45 years, females diagnosed after this time were more likely to have high blood pressure (OR = 2.78; 95% CI: 1.69–4.60; P < 0.0001). The age of disease diagnosis is a major concern for the risk of developing complications in later life. 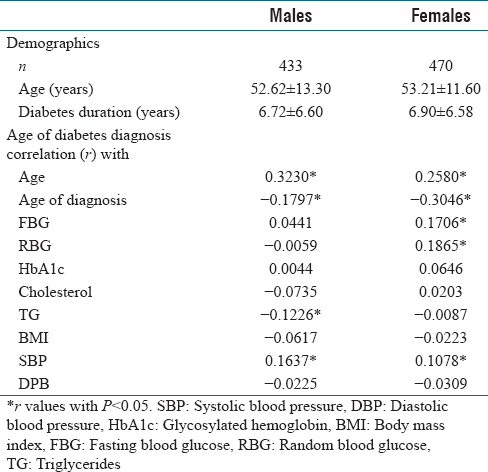 We sought to investigate if diabetes age of disease diagnosis was associated with any of the major blood biomarkers and if this differed between males and females [Table 2]. Overall, males and females were well matched for age of disease diagnosis. In both males and females, the age of disease diabetes diagnosis was positively associated with higher age and SBP and negatively associated with the age of diagnosis. In males only, longer age of diagnosis was significantly associated with lower triglycerides level, and in females only, early disease diagnosis was associated with higher fasting blood glucose and random blood glucose. There was no association of age of disease diagnosis with other major cardiovascular risk factors of HbA1c, cholesterol levels, or BMI. The ever-rising Libyan prevalence of T2DM is a threatening and most demanding situation for health-care providers, rising from about 3% in a 1980–1999 sample collected in city of Benghazi to 18.8% in another sample collected from the city of Tripoli in 2010. For the first time in Libya, our data considered the age of disease diagnosis and effect of the early onset of diagnosis in the most common signs of DM complications. The characteristics of young-onset T2DM have been the subject of a growing number of reports. A previous study indicated that a higher relative risk of macrovascular disease exists in those diagnosed with Type 2 diabetes aged between 18 and 44 years old than in those identified after 45 years of age. Another report by Song and Hardisty showed that a substantially higher risk of CVD is seen in those with earlier onset of diabetes. Only a few studies have looked at the question of complications according to the age of disease onset. More specifically, few data are available to assess whether the risk is truly in excess of that seen in diabetes presenting in the more usual middle age and beyond, after accounting for disease duration. Our study indicated that the prevalence of early-onset (≤45 years old) diabetes in Zliten is considerably high (50.39% for males and 49.61% for females with T2DM) compared to another sample from China that presented only 29.74% of all patients were diagnosed at age ≤45 years old. Some reports classify early-onset diabetes as patients diagnosed with diabetes at <40 years of age, which was also highly prevalent in our sample (34.18% of male patients and 31.49% female patients; data not shown), compared to two published reports, one from the UK in 2009 (24% of patients diagnosed with diabetes at age of <40) and the other from China in 2016 (12.5% of patients diagnosed with diabetes at age of <40). T2DM patients with disease onset <40 years of age showed substantially higher risk of cardiovascular complications. In contrast to that, this study indicated that the percentage of male and female patients with high blood pressure was significantly higher in patients aged > 45 years [Figure 2]. In addition, high cholesterol levels were most prevalent in females diagnosed at the age of >45 years [Figure 2]. The hormonal changes that occur during the decline of estrogen levels during the female menopause could explain this controversy. Females at the time of menopause are also characterized by high BMI and high triglycerides levels, and to a lesser extent, increased cholesterol levels. Obesity, as measured by BMI has been shown to be a risk factor for DM and cardiovascular disease., In our cohort, the prevalence of obesity was very high in female patients with only 5.4% of females having a normal BMI, 29.9% in preobesity, while 53.3% distributed in Grades I and II and 11.4% distributed in Grade III obesity [Figure 3]. The prevalence of overweight males was also high where only 12.4% of male patients were normal, 42.3% were in preobesity, 43.4% were in Grades I and II, and 1.9% were in Grade III obesity. Although this study provides an important initial insight to T2DM in Zliten, it is limited by its retrospective nature, small dataset, and subject to bias by its sampling method. Patients presenting to a clinic may be those that require more intense treatment or monitoring, or whose disease has progressed; all of which may be linked to an early age of diagnosis and confounding of results. Indeed, the patients presenting to the clinic with the longest duration of disease were those who had been diagnosed at an early age. However, we found no real association with early age of disease diagnosis and increase the prevalence of adverse blood biomarkers at the time of sampling. In addition, the age of the cohort (median 52 years; range 16–96) provided sufficient range to avoid skewing the results toward an older or younger diagnosis. Although only a limited amount of data was available for analysis, our results suggest that the epidemiology of T2DM in Zliten is unique and warrants further investigation. The increasing prevalence of T2DM in youth over the past 20 years parallels and follows the worldwide epidemic of childhood obesity. Predisposing factors for the development of Type 2 diabetes in the context of obesity in youth include obesity, family history, ethnicity, and an abnormal prenatal metabolic environment. Many steps should be taken to enhance the health state of diabetic patients including support from health-care leaders and stimulated organizational changes. Finally, the quality of food and exercise has critical roles in diabetic management, and a widespread study about patient disease awareness and how Libyan tradition, habits, and foods impact on diabetic supervisions should be conducted. James RG, Alberti KG, Mayer BD, Ralph AD, Allan D, Steven G. Report on the expert committee on the diagnosis and classification of diabetes mellitus. Diabetes Care 2002;25:S5-20. Salsali A, Nathan M. A review of types 1 and 2 diabetes mellitus and their treatment with insulin. Am J Ther 2006;13:349-61. Zeitler P, Hirst K, Pyle L, Linder B, Copeland K, Arslanian S, et al. A clinical trial to maintain glycemic control in youth with type 2 diabetes. N Engl J Med 2012;366:2247-56. Nanayakkara N, Ranasinha S, Gadowski A, Heritier S, Flack JR, Wischer N, et al. Age, age at diagnosis and diabetes duration are all associated with vascular complications in type 2 diabetes. J Diabetes Complications, 2018;32:279-90. Jencia Wong LM, Constantino M, Twigg SM, Yue DK. Timing Is Everything: Age of Onset Influences Long-Term Retinopathy Risk in Type 2 Diabetes, Independent of Traditional Risk Factors. Diabetes Care, 2008;31;1985-90. Group TS. Rapid rise in hypertension and nephropathy in youth with type 2 diabetes: The TODAY clinical trial. Diabetes Care 2013;36:1735-41. Huo L, Magliano DJ, Ranciere F, Harding JL, Nanayakkara N, Shaw JE, et al. Impact of age at diagnosis and duration of type 2 diabetes on mortality in Australia 1997-2011. Diabetologia, 2018;61:1055-63. Alsairafi ZK, Taylor KM, Smith FJ, Alattar AT. Patients' management of type 2 diabetes in Middle Eastern countries: review of studies. Patient Prefer Adherence 2016;101051-62. Bakoush O, Elgzyri T. Do we have a diabetes epidemic in Libya? Libyan J Med 2006;1:123-5. Hillier TA, Pedula KL. Characteristics of an adult population with newly diagnosed type 2 diabetes: The relation of obesity and age of onset. Diabetes Care 2001;24:1522-7. Nuttall FQ. Body Mass Index. Nutr Today 2015;50:117-28. Kadiki OA, Roaed RB. Epidemiological and clinical patterns of diabetes mellitus in Benghazi, Libyan Arab Jamahiriya. East Mediterr Health J 1999;5:6-13. Abduelkarem AR, El-Shaeif hJ, Sharif Si. Prognostic indices for hospital mortality among Libyan diabetic patients. Pract Diabetes 2010;27:392-5. Song SH, Hardisty CA. Early onset type 2 diabetes mellitus: A harbinger for complications in later years--clinical observation from a secondary care cohort. QJM 2009;102:799-806. Zou W, NiL, Lu Q, Zou C, Zhao M, Xu X, et al. Diabetes Onset at 31-45 Years of Age is Associated with an Increased Risk of Diabetic Retinopathy in Type 2 Diabetes. Sci Rep 2016;6:38113. Factors associated with total cholesterol levels in women around menopause attending menopause clinics in Italy. Climacteric 2004;7:86-91. Ushiroyama T, Okamoto Y, Sugimoto O. Plasma lipid and lipoprotein levels in perimenopausal women. Clinical research in 1198 Japanese women. Acta Obstet Gynecol Scand 1993;72:428-33. Bays HE, Chapman RH, Grandy S, Shield Investigators' Group. The relationship of body mass index to diabetes mellitus, hypertension and dyslipidaemia: Comparison of data from two national surveys. Int J Clin Pract 2007;61:737-47. Li G, Chen X, Jang Y, Wang J, Xing X, Yang W, et al. Obesity, coronary heart disease risk factors and diabetes in Chinese: An approach to the criteria of obesity in the Chinese population. Obes Rev 2002;3:167-72.